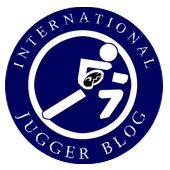 Just a little introduction before I hand this post over to another of the Australian Juggers to tell a story that should interest everyone involved in Jugger. Recenty one of the Brisbane Juggers completed a journey that has taken quite some time and has located some...interesting items....some people have already seen the items and are either intruiged or giddy with excitement that they have been found. With that I hand over to the fiend to explain what was found and tell his story. Make sure you read ALL the way to the bottom of the post for a link to some interesting pictures. it's kind of odd to be a fan of "salute of the jugger", here in australia. the film tends to be over-looked in favour of the mad max movies, all of which were filmed locally. but one series outweighs one film. i guess, for me, this particular story started back in 2005, when i started playing and i was talking to a friend of mine who said something along the lines of "my parent used to own a video store and they sent the armour from the movie and some weapons around [that chain of stores] to promote the video." at the time i pushed it back in my mind as i thought, "well, who know's where that all wound up..."
fast forward to late 2006. i'm sitting back at the house i lived in, at that time, and i was showing off my weapons to a friend who was up on a rare visit from melbourne. "oh, i remember that movie," she said, "i actually know a guy who's got some of the weapons and armour." "yes, he worked at a video store in adelaide and when they took the suits around australia, they finished their trip there and no one came to collect them, so he got to keep them." thus began a year and a half of cross talking and thinking and planning and re-planning as we tried to organise a way to meet up and verify that there were the genuine articles. now, from tales that i had heard and my own conjecture, i was assuming that i'd find a suit of armour and maybe a staff weapon. insted what i found was one complete set of armour (some of which never even got worn in the movie, but still bears the chalked-in name of the character who was to wear it) as well as a bunch of other armour pieces, the staff weapon used by cimber (the female enforcer) and the chain weapon of young gar. the same chain that vincent d'onofrio swung in the australian outback 20 years ago. in short order i arranged for the "merchandise" to make it's way back to brisbane, to allow us to use it for displays and the like. the gentleman who had procured these items had let me take all but the chain, but was kind enough to let me swing it a few times in his front driveway. as arrangements were being finalised, he relented. "i did want to keep the one piece," he said, "but after seeing how you reacted when you saw it, i'll let you have it, if you're still interested." it's in my house, right now. and every time i think about how that's a fact, i get giddy.